Shibuya is not a neighborhood where you head for haute cuisine. But all that window-shopping, people-watching, hanging out and having fun can be hungry work. So it’s good to have a few places up your sleeve that offer sustenance and respite from the crowds and noise. Maishin is one to add to that list. It comes as a relief to find somewhere that’s calm, aimed at an adult demographic and serious about its food and drink. 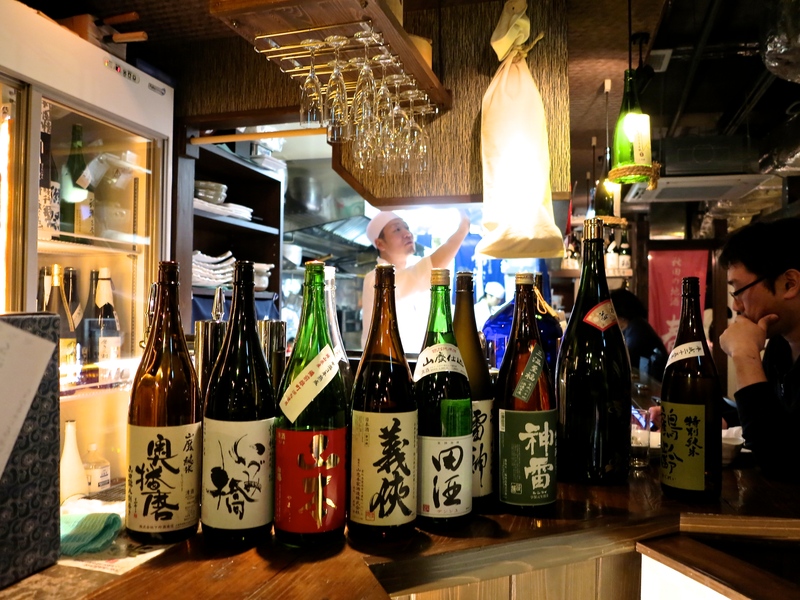 Not that you’re likely to stumble unaided on this cozy basement izakaya, despite its location just a few minutes’ walk from Shibuya’s stations and retail emporiums. 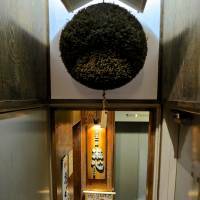 The clue is the sugidama, a large ball of cryptomeria needles hanging above the stairs that descend steeply to Maishin’s heavy timber door. This is the traditional sign that here you will find superior sake and, with it, good food and staff who understand what they are serving. But that’s only to be expected: Maishin is the latest offspring from the growing stable of sake-specialist taverns run by Noriharu Nozaki. 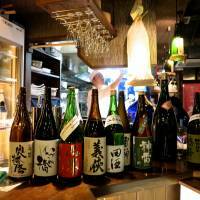 As at his eponymous branch in Shinbashi, the walls are plastered with memorabilia and photographs of breweries around the country, and the fridges are crammed with their output. Nozaki himself spikes tradition with a very contemporary feel, favoring an indigo-dyed sake-maker’s happi coat to go with his bleach-blond hair and goatee. Similarly, the food menu contains some interesting contemporary crossover dishes alongside the tried-and-true izakaya staples. There’s only one place to start, especially at this time of year, when seafood is at its very best. 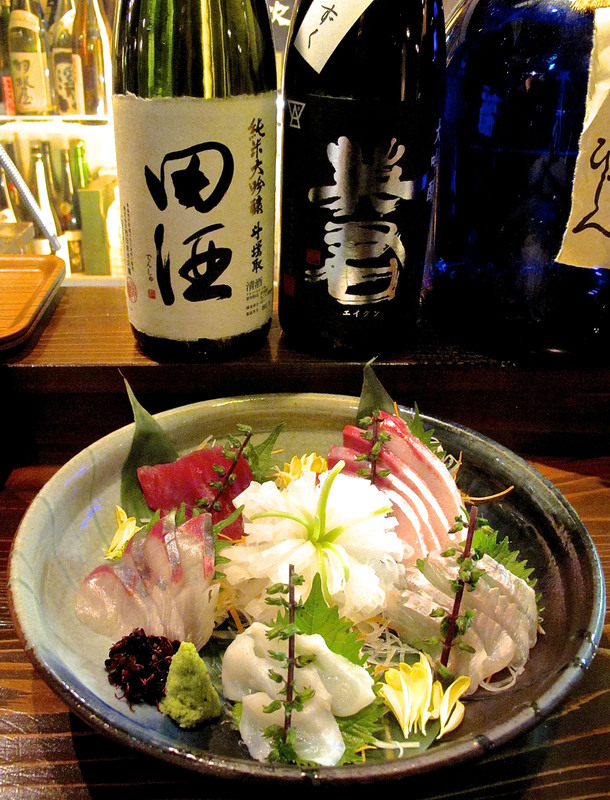 The mixed sashimi plate (just over ¥2,000 for a generous two-person serving) is a colorful still-life, complete with a carved daikon floweret as the centerpiece. It’s excellent value, and perfect with the premium brews that Nozaki and his crew have gathered from around the country. 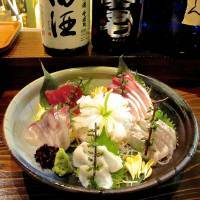 The sashimi takes a while to prepare, so it’s best to order a selection of appetizers. Smooth, creamy ankimo (monkfish liver) anointed with a tart ponzu dressing is always a treat. And perhaps a serving of ebi-shinjo, deep-fried balls of shrimp served in hot savory dashi broth. It’s all satisfying and very sake-friendly. It’s not all seafood by any means. 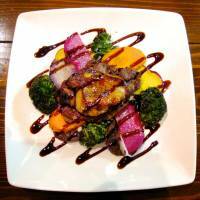 There are good salads and a range of organically grown vegetable dishes. 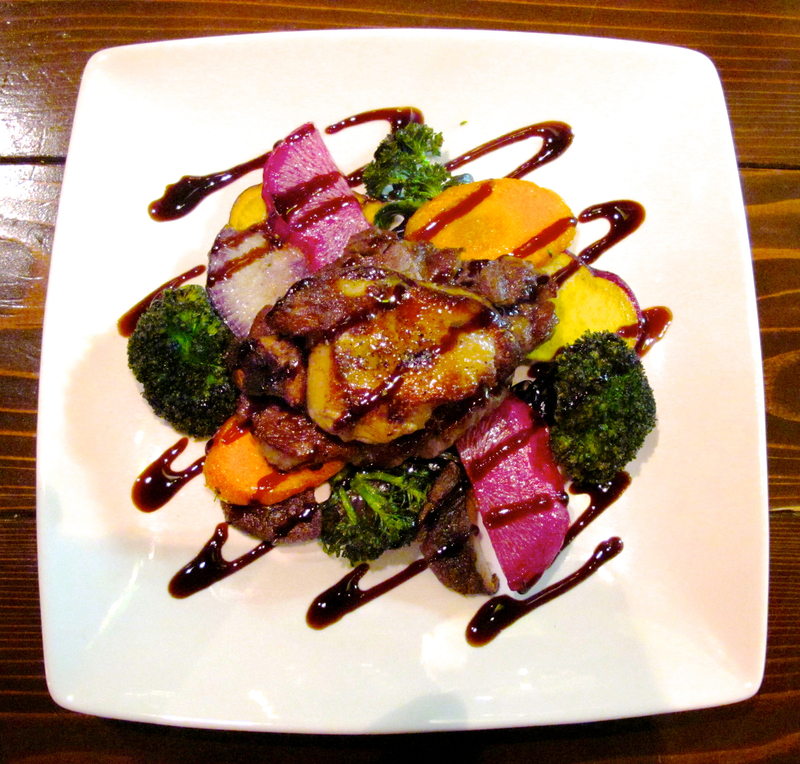 And carnivores should try the remarkable Maishin wagyū and foie gras steak. If you’re not convinced that beef goes with sake, try ordering a full-bodied yamahai-junmai and be prepared to revise your opinion. But winter is nabe hot-pot season. Right now there’s a choice of Hiroshima oysters or aegamo duck as the main ingredient, and Maishin offers a range of sizes from communal casseroles for larger groups to individual portions just right for when you drop in solo for a quick tonic at the counter to see you home. A word of warning: Only the lower half of Maishin’s sturdy front door opens, so you have to crouch to get through. It’s hard enough when you’re sober, let alone at the end of the evening. But the message is clear: dilettantes are discouraged. Suyama Bldg. B1F, 2-10-12 Dogenzaka, Shibuya-ku, Tokyo; 03-3464-1644; 5-11:30 p.m. (Sat. 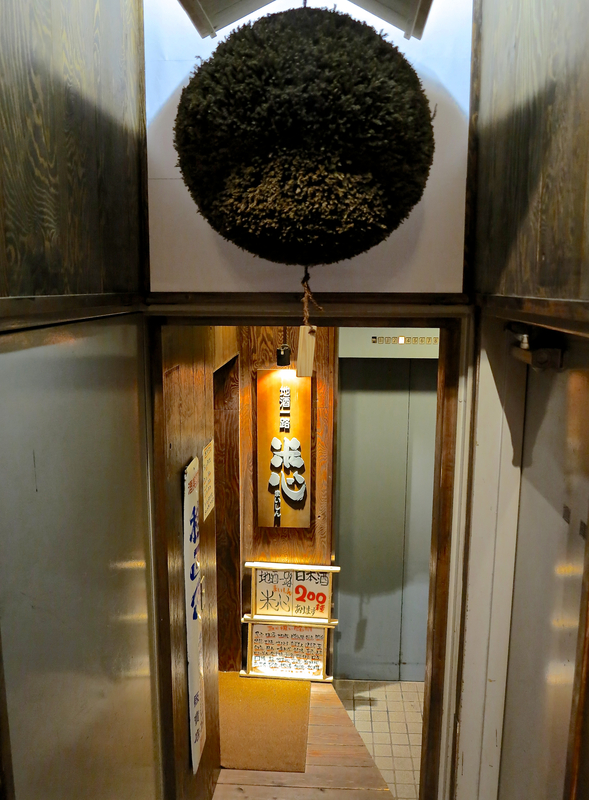 4:30-11 p.m.; Sun 4:30-10:30 p.m.); nearest station Shibuya; smoking permitted; price ¥3,500 per head (plus drinks); cards OK; Japanese menu; a little English spoken. Robbie Swinnerton blogs at www.tokyofoodfile.com. 5-11:30 p.m.; weekends, holidays 4-10:30 p.m.